On Saturday, January 26, a dozen or so curious, bilingual (at least) individuals gathered at the San Francisco State University Downtown Campus, seeking guidance and insight in determining how to use their foreign language fluency to find employment in the field of translation. Guidance and insight was provided by Michael Schubert, who led the three and a half hour NCTA sponsored presentation, Getting Started in Translation. Based on his presentation and, more importantly, his impromptu responses to questions raised by the participants, it did not take long for me to realize that Michael was definitely an expert, and that the seminar was on track to meet my expectations. 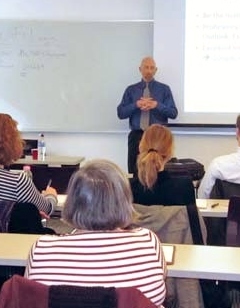 Michael’s interactive style with participants of diverse backgrounds, interests, and motivations led to a very engaging, informative, and entertaining seminar.Early on it was clear that Michael viewed fluency in a foreign language as a significant accomplishment. He noted that a professional translator should be considered a skilled professional, and was quick to highlight that with that skill came the responsibility to conduct business in an ethical and professional manner. Translators should always strive to enhance excellence and respect for the profession. In addition to the obvious common denominator of multilingualism, some attendees also possessed specialty backgrounds in biology, financial banking, pharmaceuticals, chemistry, and engineering. Regardless of their educational background, it was clear that everyone attending was keenly interested in determining whether their unique complement of language skills could be realistically applied towards building a career in translation. It wasn’t very long into his presentation that Michael succinctly outlined the two core qualifications necessary for anyone contemplating a successful career in translation: language skills and computer skills. The language skills needed were characterized as perfect comprehension of the source (i.e. foreign) language combined with excellent writing skills in the target (native) language. Michael suggested a few resources for keeping source language comprehension skills fresh: online newspapers, TV broadcasts, and podcasts. He also placed emphasis on in-depth knowledge of target language grammar. For someone new to the translation profession, Michael noted the importance of researching software available for improving a translator’s accuracy, efficiency, and productivity. Narrowing down the options is the first step to understanding the software package start-up costs inherent to a new business. In pursuing a career in translation, many tools are available. But at the end of the day, it is up to the individual to muster the high level of self-discipline required to maintain and continuously improve existing language skills and computer savviness in order to build a successful career as a translator. I think I have what it takes, what do I do now? After the first phase of Michael’s presentation, the pace and specificity of questions increased. Clearly many, if not most, sensed that they had the basics of what it takes to be a translator, and were eager to hear more about how to make this new career path happen. The next segment of Michael’s presentation focused on “building your empire.” He suggested formats for developing a one page resume, and emphasized the importance of making oneself “visible” and “connected.” Suggestions were offered on joining and becoming active in groups such as the American Translators Association (ATA) and the Northern California Translators Association (NCTA). Developing a personal website to inform prospective clients about who you are, what you offer, and why someone should hire you was also highly recommended. Michael noted that prospective translators should focus attention on the development of a clientele base and noted two principal sources of clients: agencies and direct clients. He provided additional practical information for newcomers to the industry in areas such as setting and negotiating rates, payment practices, and test translations. Michael cautioned the audience regarding the need for developing good working habits and discipline as well as the importance of setting up a productive and pleasant working environment. Highlighting the reality that one should be prepared for income fluctuation, many tips and suggestions were provided for the initial phases of starting a new career. kim posted this article under Business, Getting Started, NCTA Events	on Saturday, June 1st, 2013 at 12:05 pm	You can follow any responses to this entry through the RSS 2.0 feed. Both comments and pings are currently closed.